I recently finished reading a book called ‘Fly by wire’ by William Langewiesche. 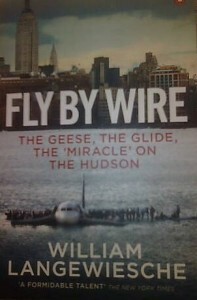 It’s an enjoyable and easy read, despite some technical detail, about the events surrounding the crash landing of an Airbus A320 on the Hudson River, New York, in January 2009. Back Ground. 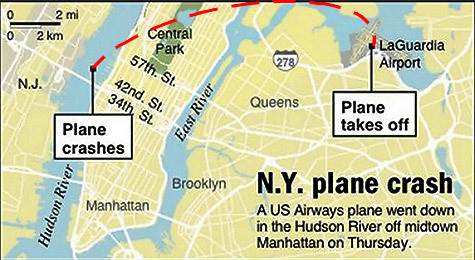 Shortly after taking off from LaGuardia in 2009, an Airbus A320 collided with a flock of Canadian geese. The plane lost all power from its two engines and made an extremely difficult emergency landing by gliding onto the Hudson River. All the 155 people on board the plane survived and the Pilot Chesley Sullenberger became an overnight hero. 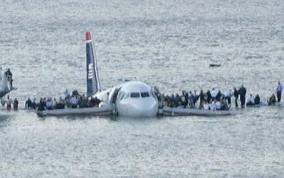 The event itself became known as the ‘miracle on the Hudson’. After the crash. The Airbus A320, which is one of the mainstays of the world’s airlines, received little praise for its part in protecting 155 passengers and crew from a watery grave, from either the media or the two pilots. While this is partly because the media were trying to concentrate on the human interest angle in the story there was more to it than that. The book goes into the background of the revolutionary design of the A320 plane and its systems which protected the occupants during the crash as well as the politics between aircraft designers and pilots. Fly by Wire. The makers of the plane involved, Airbus, are famous for pioneering their revolutionary ‘fly by wire’ control system which links the pilot to the airplane control surfaces via wires and computers, thus removing the need for heavy hydraulic systems. These ‘fly by wire’ systems allow planes to be lighter, safer and cheaper. But the ‘fly by wire’ system also allows for the plane to intervene and overrule any pilot commands if they are deemed dangerous. For example Airbus planes will not allow themselves to be flown upside down or to be flown in such a way as to experience any greater than 2.5G, as this might overstress the plane. Boeing has belatedly adopted a similar system but crucially allows the pilot to turn off these safeguards if they wish, which in the Boeing case seems to make their system somewhat pointless. Pilot fears. But some Pilots feel these systems reduce the stature of their profession. Their profession is going through some tough adjustments as a result of the deregulation of the airlines, with many pilots facing reductions in pay and conditions. But the fly by wire system can hardly be blamed for this and surely it increases the public’s confidence in pilots by preventing crashes. The incident. In the minutes prior to the crash, the Airbus control systems took over many of the mundane tasks and allowed the pilot to concentrate on landing the plane safely. His most immediate concern was whether he could make it back to the airport and once he decided he couldn’t to quickly select a landing point….quickly. During this time the plane crucially informed the pilot of the optimum speed to maintain that would maximise the gliding time, which allowed time to try to restart the engines while also avoiding River traffic and bridges, furthermore the system continued to make constant adjustments to ensure that the plane remained completely steady in the air after any pilot inputs. The resulting steady glide would be become critical when the plane finally impacted the water. Interestingly during the accident inquest enquiry the pilots when asked about the plane and its control systems, refused to praise it. The Author details the difficulties that the pilot and co-pilot had; they had taken severe pay cuts and had each started up their own companies to add to their income. The co-pilot a building company whilst the pilot a safety consultancy. The pilots may have been reluctant to deflect attention from their own actions as it could minimise their earning potential from the situation. The pilot admitted he would try to gain as much financially from the accident as possible to provide for his family and has since had books published about the crash. Based on the account given in this book it was not a miracle that no one was killed in the landing on the river but the result of good fortune, good plane design by the manufactures, and of course excellent pilot bravery to select the river as a landing point and supreme skill to ensure it worked. This book gives an excellent argument for sharing the recognition for the fortunate outcome of the crash between the pilots and the plane designers and I would highly recommend it for an interesting and strangely addictive read. There are some nice lines in the book about the Engineer and former test pilot in Airbus, Bernard Ziegler, who developed, designed and advocated the fly by wire system; “….they were working with the product of Ziegler’s mind, in which computers took care of the menial chores, then conjured up a magic carpet for them to fly” and elsewhere “Ziegler reached out across the years and cradled them all the way to the water”. Your article here…finally something needed to be said! I mean, sure – kudos to the flight crew and to the pilots for their nerves of steel, but let’s not forget that they probably had the best tech available to them in which to attempt at pulling this off. And yes – no one mentions the plane. If it were a Boieng (i.e. American made) and if it would have still worked, I bet it would have been a “US Flag – fest” with the pilots becoming Boeing ambassadors, and everybody else petting themselves on the back “USA – F…Yeah”. But since it was a French-German-UK-Italian made plane :), guess what? Nada! Also, if this would have been a Boeing, I bet Sully would have reached for that “ABS/ESP Off”-like big red button in the cocking as soon as the geese’s were cooked by the engines. “My aircraft, son. And don’t you forget it. Lemme show you how we did this in the military”. Bam! I would have liked to ran those simulations of the attempted landings that they’re showing in the 2016 Sully movie with different types of aircraft, and see how many would have pulled it off. People don’t know but as soon as Sully started up the APU, apart from engine thrust (which – sure – it’s the main deal, it’s crucial) the plane was back. Control surfaces worked again (power assisted by the APU) electrics, telemetry, radar – the works. The computer was hard at work but no one notices it. This is how you know you’ve got a great design! Anyway – the engineers deserve a beer for this! I’ve always favored sound design vs pure ego (“lemme turn that damn computer off now..”) :). Anyway – great read and will be sure to get that book!